Bless this mess....: RAK's Rock!!! Um...yeah...dorky title. But they do...RAK's rock! A RAK, you ask? RAK stands for Random Act of Kindness. These can be in many forms, but the RAK's that I see most often are scrappy stuff. Scrappers who want to share their bounty of scrappy awesomeness. And I appreciate that. Seriously. Last week, I found out that I had won a RAK from this fine lady - Leah... http://lifeaslou.blogsome.com/. 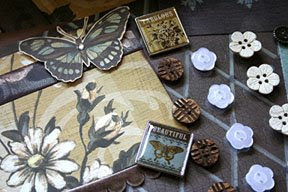 Her scrapping style is one that I find difficult to copy but VERY lovely to look at. Very vintage-y and shabby chic. She is the designer of a kit club's kits (http://www.myscrapbooknook.com/store/pastkits.shtml) and the club wanted to share May's kit. I left a comment on her blog - telling what I thought of the kit - and I won. And today...I got the kit. It is lovely. That is a picture of some of the items, in the picture above. Old fashioned flowers on paper that looks as if it has crackled paint. These are colors that I think that my mom would like. So...I am going to scrapbook a baby picture of her. Hopefully, it will turn out nicely. On another note...my camera dock is broken. (So, no new pics of the kids. Can't wait to get some new photos. They are growing so fast. Especially that baby.) It has hit the floor too many times to recover (don't ask). So....we are waiting to stimulate the economy by getting a new one...hurry Uncle Sam. Our stimulus check should be mailed soon. I also need a new dryer. And a new alternator(sp?) on the van. And some new summer clothes, haircuts, shoes for the girls. Hurry up, Uncle Sam. Write that check...lol. That is sooo deserving for you. I hope it gives you lots of sunny days as you think about how you'll use it all!! !